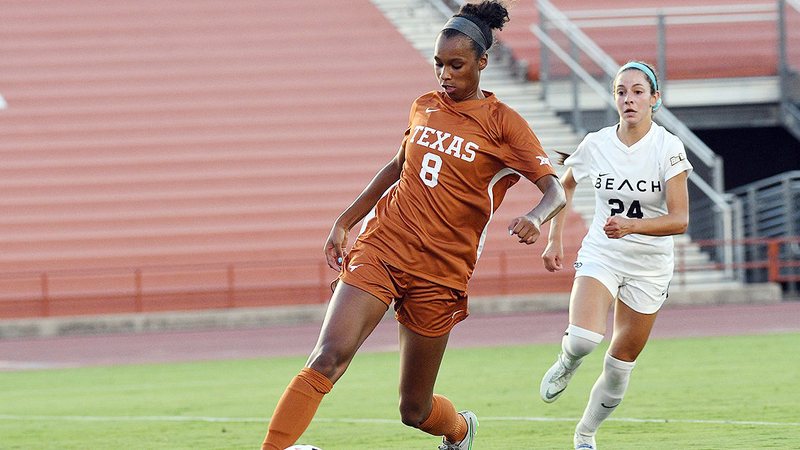 Forward Alexa Adams and the rest of the Texas seniors played their final college game Friday when the Longhorns lost to Virginia Tech, 1-0, in the first round of the NCAA tournament (photo courtesy of texassports.com). AUSTIN – A cold wind was blowing across the field at Mike A. Myers Stadium Friday night that might have been construed as the air coming out of the balloon of the Texas soccer team’s once-promising season. The Longhorns, one of the four fourth-seeded teams and top 16 squads in the NCAA Tournament, lost Friday to Virginia Tech, 1-0, closing the door on a campaign in which Texas accomplished plenty but failed to get out of the first round in the postseason for the first time since 2011. Texas ended its season at 13-5-3. The Longhorns had won 11 straight home matches, including all 10 played in Austin this season, before losing at the most inopportune time. They won’t get a chance to respond, at least not this season. The Hokies, veterans of the tough Atlantic Coast Conference gauntlet and playing against the Texas for the first time, got the only goal they needed at the 67th minute from substitute Bridget Patch, a junior who entered the game just two minutes prior to her tally. The goal, off an assist from Kiersten Hening, beat Texas goalkeeper Nicole Curry low into the left side of the goal. With that score in hand, the Hokies abandoned the counter-attacking style that netted them the lead and pulled into a defensive, outlasting a Texas team that managed just 11 total shots in the match, only two of those on goal. Virginia Tech (10-7-3) moves on to play Arkansas, a 5-1 winner over Little Rock in the NCAA Round of 32 next week. After a run to the Sweet 16 last year and a memorable regular season that ended with the Longhorns ranked No. 13, and third in the Big 12, behind Baylor (fifth) and West Virginia (sixth), in the latest release of the NCAA Division I Ratings Percentage Index (RPI) on Monday, Texas is the first Big 12 school finish its campaign. The Big 12 was rated first this week in conference RPI. Texas forward Cyera Hintzen, the Big 12 offensive player of the year, played just 18 minutes because of a lingering leg injury and was severely missed by a team that couldn’t find someone to put the ball in the net. Both teams had seven shots in the first 45 minutes, with the Hokies putting four shots on goal to just one for the Longhorns. Virginia Tech had three corner kicks to two for Texas in the first half. Texas owned a 57 percent-43 percent edge in possession percentage in the first half. Texas senior forward Alexa Adams was in tears in the postgame media session, minutes after her collegiate career came to an end.